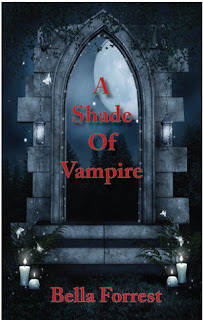 Bella has released a sneak peak for those of you who haven't read A Shade of Vampire yet! The first 6 chapters are up for you to read! Wow! What a great start to a new world of vampires. Loved this short read and can't wait to get my hands on book 2! I enjoy reading paranormal novels that are based in a modern day type setting - this story has a twist. Sofia's birthday got interesting - that's for sure - but she would've never imagined being whisked away to an island with a fortress underground & penthouses in the trees. I love how creative the vampire's world is thus far. Even though this is a very short read, Bella writes just enough details into the story that you have a pretty good image in your mind of the setting. I'd sure love to see these freaking penthouse tree-houses, LoL. Can I have one in my backyard? I would need a ladder though - I can't jump like a vampire - sadly. The characters are fabulously created. I really enjoyed reading from both Sofia's perspective & Derek's perspective. Sofia comes off as being a meek character - I sort of think of a bunny - but then you see that she actually has a backbone too. She's a very empathetic person & I loved it. Derek - oh Derek - *swoon* - waking up from a spell that was meant to make him sleep forever. After several decades, he's now in a world where he doesn't know about some of the modern day inventions: movies, cell phones, toasters, LoL. It makes him seem vulnerable in ways but then you realize that he means business. Everyone looks up to him as a leader but he seems tired of the drama that comes along with being a leader. His dad obviously doesn't like having to fall under his son & his brother Lucas *urg* sure doesn't like it. His sister Vivianne seems respectful - as well as most of the other vampires you see throughout the story. Lucas is definitely a good Bad Guy. I really dislike him - which is why he's the bad guy. That guy needs to fall in line & understand his brother is lead dog. Even though it's an incredibly short read, it's full of emotion & connections. I didn't feel rushed & there was just enough balance in the details given to where I grasped a clear picture of everything. The ending is definitely a cliff hanger in an emotional sort of way. I can't wait to continue on with the story & the world that Bella has created. I can definitely see this novel going places! There's so much room for this storyline to grow & become an amazing full-length series. Cover Rating: 1 Star <- the image itself is quite pretty - just doesn't connect to the story to me?